You are here: Home / Blog Post / Auction centerpieces: Should you sell them or give them away? These school auction centerpieces had an LED in the base and an African feel. A “for sale” sign was next to each one. When I worked as an event planner, I loved auction centerpieces. If I needed to dress the room on the cheap, I knew the trick — Forget wall decor and divert a tad more money into the table decor. Guests spend most of their time at the table, and with the right linens and a fun centerpiece – BAM – you’ve got yourself a festive atmosphere. The rest of the room be damned; if the table looked good, the theme worked. But now that I teach nonprofits how to improve their return-on-investment in the benefit auction, I’m in a quandary about these centerpieces. One method of improving ROI is to turn cost-centers into profit-centers. 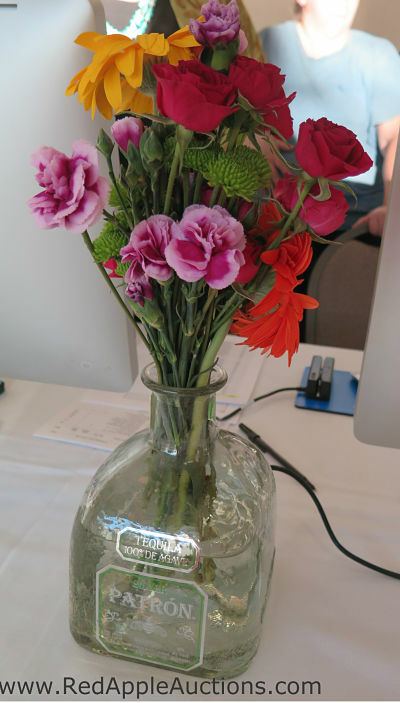 Centerpieces are a perfect example of selling a cost-center. 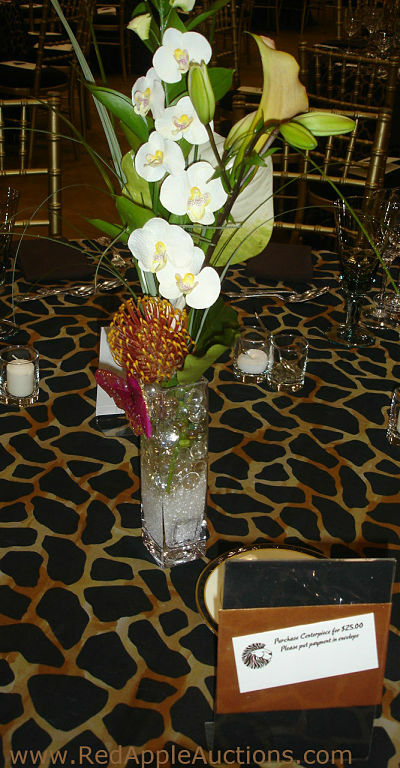 A few organizations are able to secure them for free, but usually centerpieces require a financial investment. It’s only natural a group wants to recoup that cost. But there’s a line (and it varies by organization) as to when you are being smart about raising money and when you just look like another Midwestern garage sale selling everything. 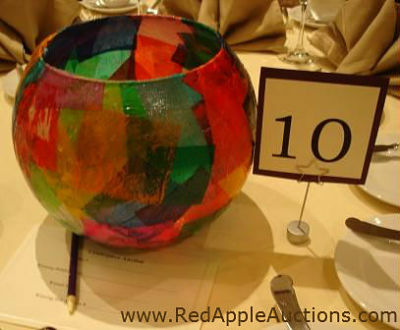 A school’s auction centerpiece can be sold more easily and for higher prices than a nonprofit’s auction centerpiece. Decoupaged centerpieces made by students were sold to the highest bidder at this school gala. When children have produced a centerpiece, and the guests are parents of those children, it is an easier sell. What parent doesn’t want to own their own child’s artwork, and simultaneously make a donation to their kid’s school? You’d be a monster not to buy your child’s work of art. This relationship breaks down if the guests are not parents of the children. For instance, if children living in a homeless shelter create the centerpiece, and the guests are John and Jane Smith (no relation to the child), the centerpiece will sell, but typically for less money. These were offered for $25. The vase was secured (for free) from a local bar. Here’s another suggestion. Consider the cost of your event ticket. If your event has a high ticket price in relation to competitive events in your area, avoid selling centerpieces. A higher ticket price attracts a different clientele. Do you really want to nickel-and-dime this guest? If I paid $500 to attend your gala, and then you try to get me to buy a $25 floral arrangement, it seems as though you’re being cheap. At that price-point, some guests will expect you to give them the arrangement. On the other hand, if I paid a mere $40 to enjoy your fundraiser, I would expect to see a number of smaller fundraisers within the party itself. A $10 raffle ticket? Bring it on. A $20 centerpiece? Of course. A dunking tank with some hunk inside wearing boardshorts? I’m there and fishing out another $25 to try my aim. In these scenarios, the selling of a low-cost centerpiece better fits your ticket price. Make your decision after considering your crowd and ticket price. P.S. Auctioning your centerpieces will make you loads of money, but there is definitely a trick to doing it right. This is all explained in my video tutorial series Charity Auction Bells & Whistles™. P.P.S. For trending auction information, read Benefit Auction Ideas newsletter. You’ll get fresh ideas on sponsorships, procurement, raffles, and more. I am in charge of decorations and centerpieces for an auction with a Toy Story theme any ideas for centerpieces?